Felicia Rose Adler was depressed. Reality was not living up to her dream. She sunk gloomily in her chair and looked at her book. Master Dating is a fun, powerful book designed to help singles navigate the treacherous waters of the dating scene. She had nursed this book from conception to hard cover, having braved the many minefields of publishing. A first time author, she found a publisher, got an advance, suffered the torments of editing and rewriting, helped design the cover, got quotes for the book jacket, and worked hours on publicity, doing television, radio, and print interviews whenever possible. Her positive, upbeat energy She thrived on the hustle and bustle of book promotion, and her eyes lit up whenever she talked about her book. A year later, she had sold one thousand books. Her vision had been to sell one million books. She dreamed of making a powerful impact on millions—and making millions. Alone in the darkness, she realized she had made the success of this one book too important. She saw its lack of best-seller status as a reflection of her unworthiness. She identified so completely with the book that if someone rejected it, they were rejecting her. It was personal. It was devastating. Suddenly, a thought struck her with complete clarity: “I am not my book.” She got out of her chair and tied one end of a string around the book and the other end around her finger. She paced the room for a while, dragging the book behind her, looking at it from different angles, feeling the tug of the baby for its mama. Then she cut the umbilical cord and was free. When The Wealthy Spirit was released, I made peace with the fact that the statistical realities of book publishing meant that it might not be a bestseller, or even sell enough books to pay back the advance I received. A humbling thought, but the marketplace is very crowded, and I wasn’t very well known outside of the small business community in Los Angeles. I decided that if only a few people found my book to be helpful and inspirational, I would be content. As with any other commercial product or service, Marketing is Everything! There were over 328,000 books published in the United States in 2010, and the total books published throughout the world was 2,200,200! Barnes & Noble Bookstores have between 130,000 – 140,000 books on their shelves. Amazon.com has over 8 million books listed online. How are you going to get yours to stand out? National media exposure is the key to the blockbuster bestsellers. You will most likely need help with this, even if you have high-powered contacts of your own. I can’t even begin to list all your options here, but to give you a hint, read: Publicize Your Book by Jacqueline Deval, 1001 Ways to Market Your Books by John Kremer, and Sell Yourself Without Selling Your Soul by Susan Harrow. 1. 2% of the 300,000 books published each year become bestsellers. 2. 84% of the bestsellers are published by the 5 largest New York publishers. 3. 2 out of 10 books published make a profit for the publisher. 4. In 2004, 950,000 titles out of the 1.2 million tracked by Nielsen Bookscan sold fewer than 99 copies. Another 200,000 sold fewer than 1,000 copies. 5. Only 25,000 books sold more than 5,000 copies. 6. The average book in America sells about 500 copies. 7. Only 10 books sold more than a million copies in 2004. 8. Fewer than 500 books sold more than 100,000 copies in 2004. 9. The magic number for a book to be considered successful is 10,000. 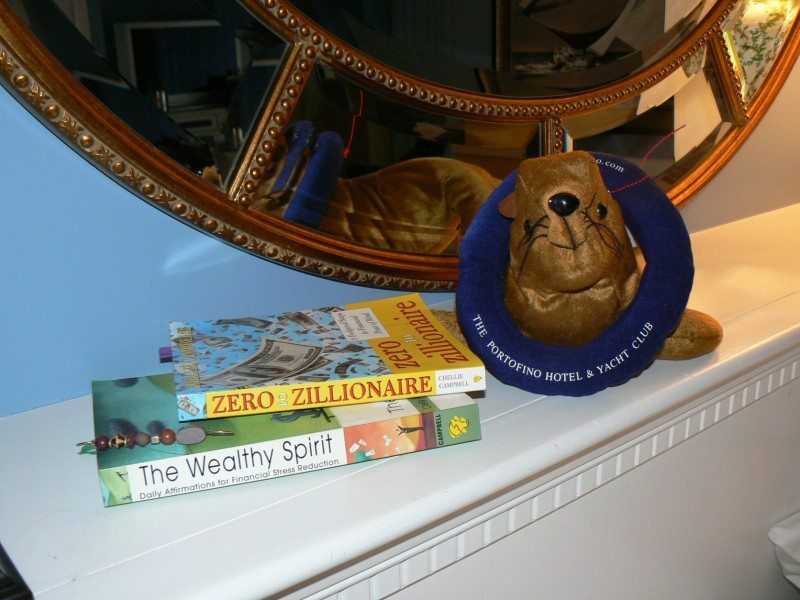 When The Wealthy Spirit reached 15,000 books sold, my editor called me and said, “We’re ready for your next book!” So I wrote Zero to Zilliionaire in 2006. And now I’m writing my third book, Financial Stress Reduction for Women in Business to be released in January, 2015. I am thrilled to report that together, my books have sold over 30,000 copies and this year is the 11th anniversary of the publication of The Wealthy Spirit. I still receive lovely emails from Dolphins all over the world who are reading it daily who say it has helped them. What I never imagined was that people would read the entire book and then start over again on day one and read it for another year. I spoke with a Facebook friend and asked him how he found me, and he answered, “I’ve been reading a page a day of The Wealthy Spirit for 8 years.” I am so grateful and honored to be a positive influence in the lives of my readers. I treasure every note and comment from each one of them and my heart is full. When asked what my favorite books is, “The Wealthy Spirit” is my choice, my bible.